These techniques work well in groups up to about 15 people. In order to use them, you’ve got to be a student of human nature. Pick out the best liked, most powerful or influential members of the group. To suss out who there are, look at who other people are looking to for approval, who is in demand during breaks and who folks want to sit next to. Use traditional NLP matching/mirroring on those folks. If you speak, speak to these people. As you’re speaking to them, match their tone of voice and pace. * Note: When you’re matching someone who has a position of power, don’t overdo it. It could be seen as a challenge. Pace subtly. Even if you don’t speak, you can take turns matching and mirroring the leaders of the group dynamic. You can also rotate through a group, pacing each individual, in turn, for a few seconds. It’s best to acknowledge everyone, if the group is small enough. I spent a couple of years in Russia in the mid-’90s. When I first landed in St. Petersburg, I didn’t speak Russian at all–yet I was expected to sit in meetings, lead a team of Russians and in general, get folks to follow my directions. Since I couldn’t speak the language, all of the fancy-pants language patterns I’d learned went right out of the window. What was left was rapport. 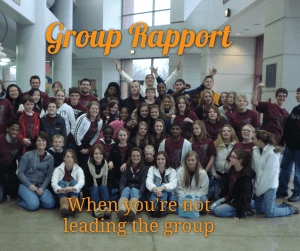 It’s amazing hw far I could get with a group just by picking out the leaders and generating rapport.